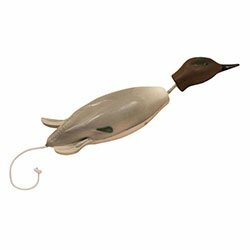 While not a precise replica in size and weight, Teal Dead Fowl Trainers are a good size to use with Retriever puppies and smaller breed dogs to teach proper retrieving techniques. 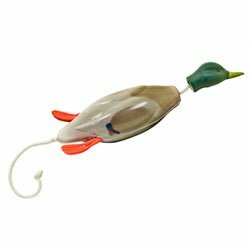 The hard head and legs will encourage puppies to hold the Dead Fowl Trainer in the middle creating a proper hold. 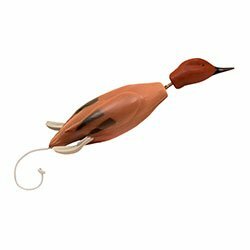 The free swinging head will correct any aggressive shaking with a light correction to the snout. 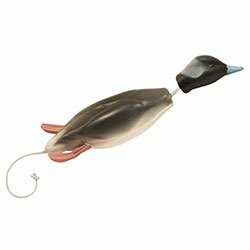 These Teal have a natural game bird feel, a dead bird neck, will not sink, and are easy to throw and have an internal scent system. Dead Fowl Trainer Internal Scent System -- To internally scent your Dead Fowl Trainer: Inject the training scent into the middle of the foam body in six different locations using the Dokken's Dead Fowl Scent Injector or a syringe (not provided). The foam body is designed to hold the training scent whether using the dummy in or out of the water. 1/2 to 3/4 ounce of training scent is sufficient.